It could be a hugely valuable addition to Bixby Vision. Samsung has made it clear that it wants to get its Bixby virtual assistant on nearly every product it makes, but it hasn't forgotten about the AI's smartphone roots. To that end, the company dedicated a corner of its cavernous CES booth to a surprising new Bixby feature: the ability to identify your food and spit out a calorie count. The feature definitely isn't ready for public consumption yet, but it did a surprisingly good job telling a margherita pizza from a plate of salmon sushi from a juicy (if fake) steak. 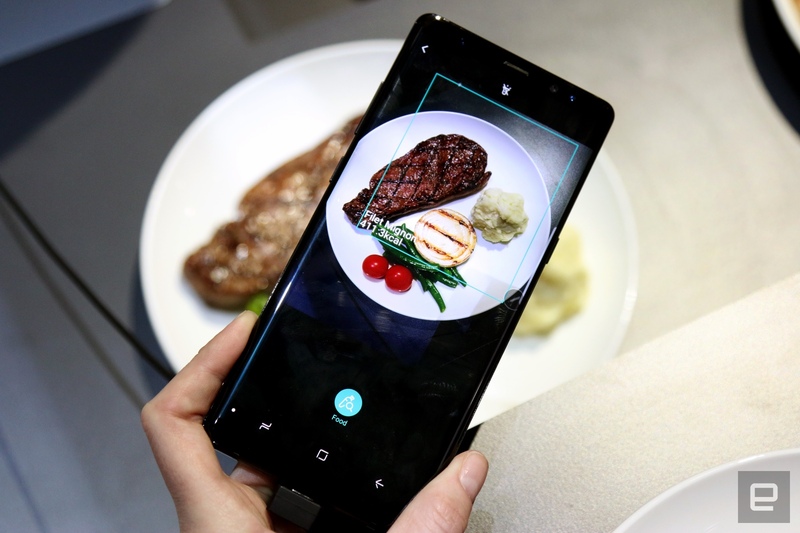 That said, you shouldn't expect Bixby to look at a dinner plate and correctly identify everything on it -- at least in its current form, you'll have to point the phone's camera at each individual food item to get the corresponding calorie counts. Of course, the way you whip up a risotto may differ from ours, and Bixby can't tell the difference just by looking. (We do love extra butter here at Engadget.) Samsung representatives say Bixby will use the "generic data" for food items, so the calorie counts won't be absolutely spot-on, but if nothing else, it's faster and easier than firing up MyFitnessPal and inputting each ingredient separately. Representatives also said that food data will be folded into a profile within the Samsung Health app to better help people understand the calories they're taking in addition to how many they're burning. There's no word on when -- or even if -- the feature will wind up on Galaxy smartphones, but it's still nice to see Samsung's virtual assistant getting capable over time. Here's hoping this feature is more polished than Bixby itself was when it first launched early last year.